Mafia Wars, Zynga’s hugely popular massively multiplayer online game, encourages players to rob, extort ,and kill as much as they can with the goal of amassing more power and money than Al Capone ever dreamed of cramming into his secret vault. With some 10 million Mafiosi warring on Facebook and comparable numbers on MySpace, it was only a matter of time before Zynga expanded its empire to the iPhone and iPod touch, spawning a host of imitators. (Zynga’s game was itself an imitation of Mob Wars, which led to the inevitable copyright infringement case. Mafia Wars for the iPhone and iPod touch is a slick derivative of Zynga’s Facebook godfather. The app has certain distinct flaws, but it still sets a high bar. Jeff Witt’s ambitious but imitative iMobsters and The Godfather’s deeply flawed iMob Online ( ) are both variations on the same game. The essential questions facing each are: Is the game playable? Is it reasonably free of bugs? Is it fun? Strength In Numbers: While you start from scratch in the iPhone version of Mafia Wars, you can import your Mafia from the Facebook version in fights, so the playing field isn’t always level. I’ve been hooked on Facebook’s Mafia Wars for a few months now. For my labors, I am a Level 246 master boss with a carefully cultivated gang more than 450 strong, a real estate portfolio that would make Donald Trump envious, and an arsenal worthy of most “developing” nations. So I was initially dismayed with the Mafia Wars app. Truth is, the Mafia Wars app will likely be an immediate disappointment to Facebook veterans who have spent a lot of time building up their characters. The problem is, the game isn’t linked to Facebook. Yes, you can import your Mafia for fights—gang size matters, even in the early levels of the game when you aren’t as well armed or defended. But all of those jobs you’ve completed and those fights you won on Facebook? Sorry. You start from scratch. That’s a strange deficiency, I think. It’s not as if Zynga doesn’t know how to link its mobile games to Facebook. After all, Zynga’s Live Poker app uses Facebook Connect. Perhaps Zynga wanted players to start the game fresh and on a level playing field. But if that’s true, the developers shouldn’t have allowed players to import their Mafias. In any case, any ill feeling should pass if you stick with the game long enough. The mechanics of the mobile Mafia Wars app are essentially the same as the online game, and it can be just as addictive. The iPhone version certainly looks better than the Facebook game, with more interesting graphics, animation, and a tight interface. As with the Facebook game, you need to buy certain weapons to carry off certain jobs. 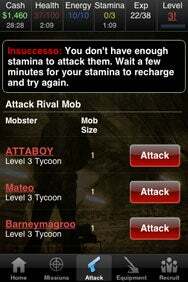 You can retaliate against other mobsters who’ve attacked you while you were offline when you sign back on. You can visit the Godfather for money, extra Mafia members, energy, health and stamina refills, skill points, and the like. You can also purchase points, which is why Mafia Wars’ creators fall asleep at night atop enormous fluffy piles of cash. Unlike the Facebook version, there is no bank, no hitlists, you can’t rob your opponents, and there are no job tiers and titles. Personally, I miss the hitlists. But there is a running news ticker at the bottom of the screen that keeps players apprised of who’s playing. A number of users complained on the Zynga forum and on the game’s App Store page that the most recent game update made the app slow and buggy. I haven’t experienced any lag or any crashes. I did notice that my health and stamina were not regenerating when I was logged off, but that problem only lasted for a couple of days. You Say Tomato, I Say Fugeddaboutit: The terminology is different in iMobsters than it is in Mafia Wars, but the object of the game is strikingly similar. iMobsters by Jeff Witt is different in style, but nearly identical in substance, to Mafia Wars. You have “missions” instead of “jobs,” buy “real estate” instead of “properties” and “favor points” instead of “Godfather points,” and commit generic crimes such as “grand theft auto” and “collect protection money” rather than the more cleverly labeled acts of theft and mayhem on Mafia Wars. One of the better features on iMobsters is the ability to broadcast messages to your Mafia. Of course, that’s only worthwhile if you have a gang larger than one. That points to the biggest drawback of Mafia Wars, iMobsters and iMob, too: The relative difficulty of building your Mafia. It’s often the case that the bigger you are, the harder you fall. What Zynga and like-minded developers need to do is make it easier for players to network and build their gangs from their handhelds. Currently, the games rely on players recruiting from their e-mail and phone address books. But as anyone who has tried to recruit their “real” friends on Facebook knows, it simply isn’t enough. If you’ve imported your hundreds of Mafiosi from Facebook, you will find yourself blasting away at other gangs of one or maybe two. On Facebook, there are dozens—hundreds?—of groups dedicated to helping you build your Mafia as quickly as possible. There are several Internet forums devoted to building your mob for the iPhone version as well. And yet I suspect few players really want to spend a lot of time trolling boards for adds and typing in a bunch of ID numbers on their phones. Where’s the fun in that? 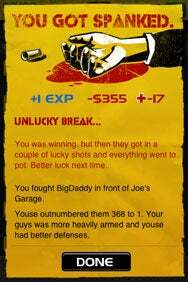 I don’t know about you, but I’d rather be gunning down rivals and pulling off the next big mega-casino heist. The developer who finds a way to overcome this problem would make an app that players couldn’t refuse. Both applications are compatible with any iPhone or iPod Touch running the iPhone 2.0 software update and require a Wi-Fi or 3G/EDGE connection.